U.S. Sen. John Thune, R-S.D., said Monday that he will introduce a bill to establish new standards for prescribed burns like the one that escaped this month at Wind Cave National Park. That blaze, named the Cold Brook Fire, began as a 1,000-acre prescribed burn but turned into a 6,500-acre wildfire. A park spokesman has said the burn was "in prescription" when it began, meaning a set of conditions existed that led the park's superintendent, Vidal Davila, to approve the fire after a test burn. Thune is not satisfied with that explanation. "It's another example of people operating in a Washington-induced bubble and following a formula that is just completely absent any local input, consultation, discussion or intelligence," Thune said. "That's got to stop." The Journal sought an interview Monday with Davila about his reaction to the bill, but park spokesman Tom Farrell said questions will be referred to the Office of the Secretary of the Interior. Thune's office said the bill was still being worked on and could be introduced Wednesday. Thune said the bill "lays out some conditions that have to be met before they can fire it up." He said those conditions will probably include consultation with state and local governments. "We're not trying to impede their ability to do prescribed burns," Thune said. "Obviously, they can work as a tool in some circumstances. But when they go about it this way, they're just asking for trouble. So we think there ought to be at least some conditions that they have to give consideration to before they do it." Before humans began suppressing them, wildfires occurred naturally in grasslands and forests. Prescribed burns are sometimes conducted to mimic the positive natural effects of wildfires. Wind Cave officials hoped to stave off a catastrophic wildfire by burning off some of the thick, dry vegetation that wildfires feed on. 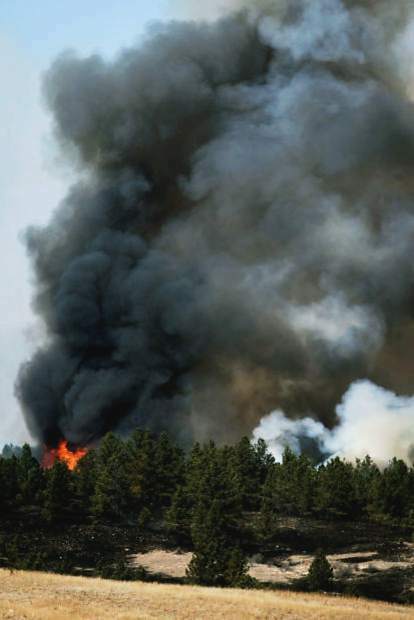 Although the park spokesman later said the prescribed burn was in prescription at the time it was lit on the morning of April 13, the Black Hills region also was in the midst of one of its driest, most fire-prone spring seasons in recent memory, and there was already a fire-weather watch in effect for the following day. Stronger-than-forecast winds on the afternoon of the burn blew embers across the fire line and ignited dry grass. Firefighters spent the rest of the week containing the wildfire within the park. Thune has said his office took reports that fire lines were established on private property and smoke may have damaged the lungs of ranchers' young calves in the area, resulting in a higher risk of pneumonia and death. Last week, in reaction to the Wind Cave fire, Thune sent a letter to Interior Department Secretary Sally Jewell seeking a change in the department's prescribed burn policies. He asked the department's National Park Service to accept full liability for damages and expenses incurred by individuals and local and state governments, and to provide a timeline and process for reimbursement. Thune said Monday that he's upset about not only the Wind Cave fire, but also other fires, including the 2013 Pautre Fire near Lemmon. That fire began as a 130-acre prescribed burn by the Forest Service but spread to a 10,800-acre wildfire across public and private land. "We can't have this pattern continue," Thune said.